Laura here today, creating a peppermint candy card perfect for the holidays using The Rubber Cafe' -T'was the Night Kit of the Month! The pop of black against the red and white is so different.... just love that it's not the traditional everyday card, don't you? Base in black cardstock - 4 1/4" by 5 1/2"
White cardstock - 4" by 5 1/4"
Black Dot Paper - 3 3/4" by 5"
The white circle die cut was then trimmed along the edge of this red piece to fit. 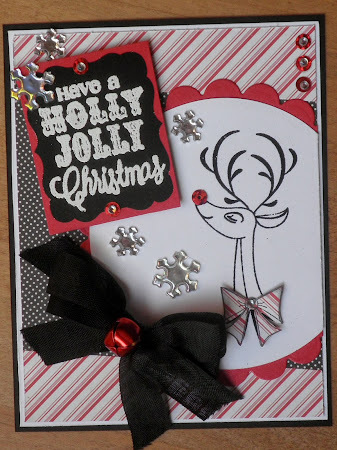 Begin by using the Reindeer stamp from the T'was the Night KOTM and stamp using Versamark ink and black embossing powder directly onto the right side of the trimmed white circle piece. The bow part of the reindeer was stamped in Black Tuxedo Memento Ink on the peppermint stripe paper, cut out, and foam taped to the reindeer. For the sentiment, I used one of the Chalk It! chalkboard stickers a piece of red cardstock, trimmed it to fit, then stamped and embossed the Holly Jolly sentiment in white (be careful when heating this so the sticker doesn't bubble up....though the cardstock under it helps with this). The sentiment is foam taped to the edge of the circle, and then snowflakes, sequins and bling were adhered using Scrap Happy Glue to bling it out. The double seam binding bow has a jingle bell tied around it with plain black thread, and then it was glued to the edge of the frame. Feelin' the Holly and Jolly of the holiday? 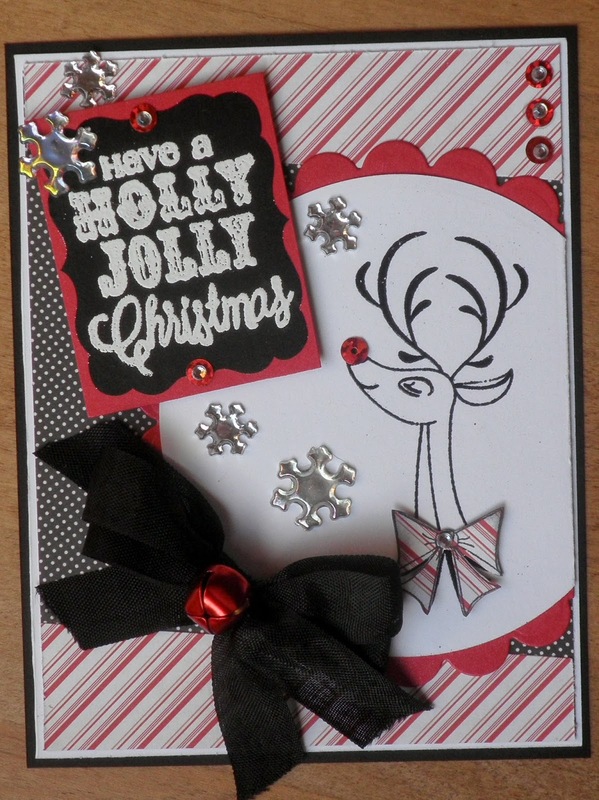 Hope you are inspired to get your holiday card making started! It's easy to find inspiration in this month's Creative Cafe' Kit!! Thanks for stoppin' by the cafe' today! Tools/Dies: Spellbinders -Classic Circles and Scallops. Very cute, love his little bow tie! This is such a cute card, Laura! I understand your busy-ness. Tis the season!